The environment on the Earth and firmament was very different in the Days of Noah. A cloud covered the surface of the planet. Rain was held in stasis either providing a nourishing rain or a rain of destruction. Riding upon the firmament is the Price of the Power of the air undulating across our skies in his serpentine form, with barely a notice. He is part angelic and part technology. As we approach the End of Days his appearance is getting more frequent, and lo, we return to the Days of Noah, as was foretold. Today we witness the skies erupting with life, a technology, geo-engineering, and mysterious luminous phenomena cloud our planet and hold destruction in their iron fist. Precisely one week before the much touted solar eclipse, on August 14th, a new sprite was photographed with a strange curved snake-like for emanating from the cluster. It is critical to understand that these celestial events have only recently been documented, classified, and cannot be found in an ordinary Field Guide to Weather. Sightings of new luminous ‘events’ are increasing. These can only be seen from space or using telescopes and observatories but the day may come when they dance like the devil in our skies. Not quite 30 years ago, researchers in Minnesota first captured an image of what they described as atmospheric lightning. Scientists now accept these ‘transient luminous events’ with intriguing names such as sprites, elves, gigantic jets, and gnomes. They reach towards the heavens instead of normal lightening which strikes the earth. A sprite is a bright flash of red light that occurs above storms. It is known as Upper-atmospheric lightning or ionospheric lightning which lasts a millisecond to 2 seconds in duration. Upper-atmospheric lightning is believed to be electrically induced forms of luminous plasma. Blue jets are a high altitude optical phenomenon, distinct from sprites and first documented in 1994. Blue jets are optical ejections from the top of the electrically active core regions of thunderstorms. Blue starters are bright and shorter (reaching to only about 12 miles altitude). These are reported to occur over regions where large hailstones were falling. Elves are disk-shaped regions of luminosity that expand rapidly. It is thought that Elves result when an energetic electromagnetic pulse (EMP) propagates into the ionosphere. Elves got their name as an acronym for Emission of Light and Very Low Frequency perturbations due to Electromagnetic Pulse Sources and were discovered in 1992. Trolls resemble blue jets, but are red and seem to occur after tendrils of vigorous sprites extend downward toward the cloud tops. 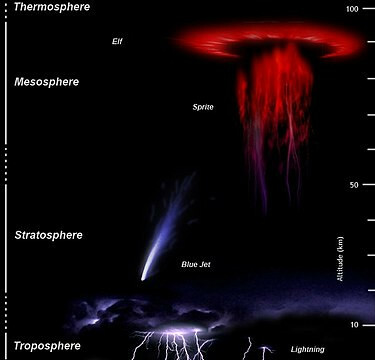 Gigantic jets were not discovered until July 2002, are similar to carrot-shaped red sprites in spatial extent but propagate upward from the core of oceanic thunderstorms and are not directly associated with cloud-to-ground lightning. Gnomes are possibly just a different manifestation of blue starters but appear with a more compact shape above convective domes. Another theory by Jozsef Bo'r of the Geodetic and Geophysical Research Institute in Hungary, is that, it was a “gigantic jets are like sprites on steroids—powerful and bright. 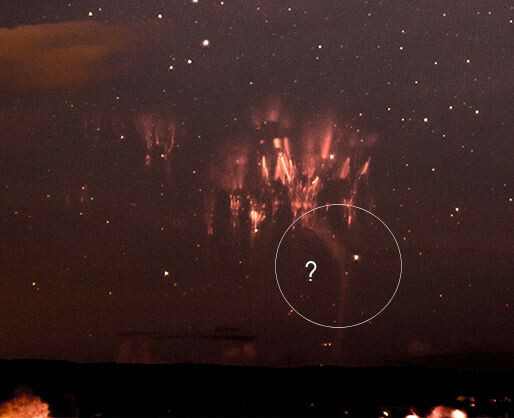 A working hypothesis is that the red sprites in the photo occurred first and deposited a cloud of positive charge above the thundercloud. A subsequent gigantic jet was itself rich in positive charge and had to bend around the positive cloud on its way up." Those with private observatories say to witness this celestial phenomenon is an extreme rarity. TIPPS (Trans-Ionospheric Pulse Pairs) are extremely intense pairs of VHF pulses originating from thunderstorm regions, but some 10,000 times stronger than sferics produced by normal lightning activity. Gamma ray bursts of short duration (about 1 millisecond) with terrestrial origin have been detected by the Compton Gamma Ray Observatory. They are observed to occur over thunderstorm regions. While our atmosphere unto the firmament has always been very dynamic, never before have the heavens come alive with mischievous demonic creatures, more suited for the underworld, than the abode of the God’s angels. And what will the outcome be for our planet?